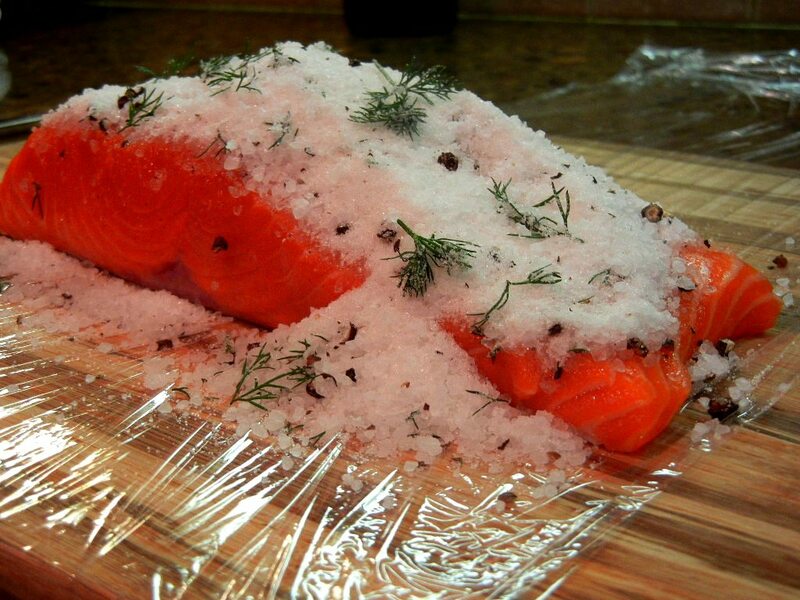 Combine all the spice and herb ingredients, pour over the salmon fillet that has been placed skin side down on a large piece of clingfilm. Cover the fish evenly with the salt-sugar cure. Wrap tightly in the clingfilm. Tightly wrap with two to three successive large pieces of clingfilm. Place in a pan under a cutting board that has been heavily weighted with cans. Turn the fish every twelve hours for two days. Remove clingfilm and dry. Thinly slice and serve. Maybe with some bagels from Katzinger’s, and some of their dry, salt-cured mountain capers, C-bus citizens. And remember when Oakvale made cream cheese? Me, too. That would have been perfect. Playlist included the very dramatic Every Shining Time You Arrive, by Sunny Day Real Estate. We are so doing this – who knew it was so easy!? Thanks for posting the recipe! Love the Copper River salmon; such a treat! Great photo and post. We WILL be doing this (we have king salmon in our area now- very excited). Thanks. I just sliced into it. And I can’t even begin to tell you how delicious it is. Make sure you have accoutrements when you’re ready to serve it.